This method is not guaranteed to work however, and on an iPhone X with a whopping 25.6 GB system size, it only freed up less than 1 GB. Some users may report more dramatic changes in the size of “System” but there does not seem to be much rhyme or reason involved, if you have any hunches share them in the comments further below. What on Earth is Apple doing to bloat iOS system out so much that it takes up 25 GB of storage space? I thought this was supposed to be the lightweight mobile operating system of the future? 25GB!? That’s bigger than a base macOS or Windows installation! Oddest thing happened to me too. I tried to do this because I noticed that my “system” was taking up like 7-8GB of my 16GB phone space. Interesting. I tried this and on one iPhone it shrunk the System size by about 1GB. Tried it on an iPad and it shrunk it by about 3GB. Why does this work? Is it priming for a backup and performs cleaning function? That is my best guess. But also why the heck is the System size so huge? A 128GB iPhone and 15% of the size is taken up by “System” and another 10% by “Other” …. great. Another possibilty to cleanup the System overbloat (on devices with small memory). When you see that the system data is way above 12-14 GB go to iStore and choose a film which is larger as your total free memory on device and download it. At the end will say Not enough storage but surprisingly the System data amount will shrunk considerabily. Why? No idea! I see this on my iPhone but not on my iPad. iPad Storage/System look at amount, watch for change, following the article instructions. It’s all the way on the bottom, separate from the list of apps. I do see it on an iPad Pro (the 10.5” model). iPad Air running iOS 11.4 does not display current system storage size. There is nothing separate from the list of apps at the bottom. On iPX back up to iTunes, ‘restore’ to factory settings, then ‘restore’ from backup. Got back 10+ gigabytes of storage space on a 256 iPX. Backing up may take a while depending on storage used, restoring from backup was O.K. though. “System” on my iPhone X is taking up 17 GB but I have seen it as high as 28 GB. It seems to me that the size shrinks after the iPhone completes a backup, but still 17 GB is an enormous System folder. I would love to “backup and restore” the iPhone X but it is 256 GB and my Mac doesn’t even have that much disk space because Apple ships Macs with tiny hard drives. It just works! Sometimes I wonder if people that work at Apple use Apple products, or if they use something else. Do they not encounter these things? Do they not wonder what it is? Do they not attempt to fix, remedy, or address the problem? Do they have people working on this stuff, or is the entire company working on subscription music services and politically correct Emoji characters? This is so interesting – and something I had never really thought of. The system storage on my 256 GB iPhone 7 is 36.35 GB! That seems crazy to me! I’m going to try the iTunes trick. I’ll keep you guys posted! 36GB of System on iPhone?? That is CRAZY. What on Earth is iOS doing? On my 2018 128GB iPad, “System” is 68GB taking up more than half of total storage. 68 GB of System storage on an iPad is simply outrageous. Apple now sells larger devices but the System of iOS takes up most of the space, what’s the point of buying a bigger device if it’s going to vanish to huge System bloat that nobody seems to understand? Has anyone spoken to Applecare about the System folder and asked them why it’s so big and what they are doing about it? Is Apple aware this is a problem with the System of iOS? How can they not be? But that doesn’t seem to happen to everyone. System is only 2.24 GB on my ipad pro 10.5”. On mine it’s only 2.24 GB!! talk about variation…Sounds like we’re on the verge of a new scandal, just like the battery scandal last year. It seems apple may be intentionally coding so that iOS bloats and takes up lots of space on some devices. It could be a trick to get more people to buy or upgrade icloud storage, just like slowing down the phones was a trick to sell more. Stranger and stranger! I tried reducing System Storage by connecting my iPhone SE (iOS 11.4) to iTunes on my Mac as described. In fact the amount used by the System was quite low, but I was interested in what might happen nonetheless. Before doing this, System Storage was shown as 6.27 GB. After leaving the phone connected to the Mac for some minutes, System Storage was shown as…wait for it!…6.69 GB! Reduced? After disconnecting, it then went up by a tiny further amount to 6.7 GB. Finally I went through the procedure of reconnecting to iTunes and waiting again, but the amount remained at 6.7 GB. My iPhone actually went up! From 13gb to 20gb! That’s lovely, an exponentially growing System storage on iPhone! Don’t you just love the consistency from iOS? One minute your System storage is huge, the next minute it’s twice the size. Great? OK really though, plug it in and back it up. It seems like the backup is what shrinks the System storage for me. Maybe the System grows with backup data that gets cleared once the backup completes? You can also backup, erase, and restore, but that takes so long on large capacity devices that it is impractical beyond reason. Mine went from 9GB to 11GB when I tried it! OK … weirdest thing. I typed my response above last night when I was in bed – with intent to try the iTunes trick today after work. Then WHILE I WAS LOOKING AT IT, the number changed to 15.21 GBs! Yes, seriously, right in front of my eyes!!! So I am now thinking that number is basically meaningless. Hopefully Apple will fix that bug soon! Removing shortcuts from the screen of an iPad will also create a lot of additional storage. The URL of whatever the shortcut relates can be stored in a Pages document and with practice can be stored a lot more efficiently e.g. Don’t forget that Apple may not be the culprit for the bloat … as some third party apps tend to cache tons of data to save time and keep things speedy on mobile devices. Facebook is famous for this and retains far too much data than is necessary IMHO. If you travel a lot, navigation apps and weather apps set to go into cache overload as well compared to folks that stick closer to home. What would be nice if we had the ability to allocate cache space on a per app basis instead of letting the apps or the system determine that usage. @ButchM makes a great point, this could be third party app behavior but usually those third party apps bloat themselves with Documents & Data. I wonder if something changed. As for Facebook, I wouldn’t use it, I would not recommend it, and I definitely would not install it on my iPhone ever. Anyone using Facebook is crazy if you want my opinion! And I will second @ButchM suggestion that it would be nice if there were “Dump Cache” buttons on every single app, as well as on iOS System, to clear out storage, because iOS cache management is obviously not efficient. This is something Android has that iOS still does not. and it was 19Gb again. Did the trick again went down and up again..
Is there a way to see this in iOS 10? Thanks! Just manually closing suspended apps shrinks it considerably. I typically close all suspended apps every few days. I’ve never paid much attention to storage before, but I looked after reading this article and found my system storage at 7.6GB. I just killed all the suspended apps again and it immediately dropped to 5.2GB. I suspect that for most people that never do this, it would not be uncommon for tens of gigabytes of storage to be consumed just by suspended apps alone. Most people don’t realize that for every app that is suspended, iOS has to maintain data about the suspended state. I wouldn’t think it would amount to multiple gigabytes of data, but I only closed about 20 suspended apps and recovered 2.4GB, so for me it averaged out to about 120MB per app. I assume this will also vary per app – some apps may require much more data to maintain the suspended state. Please explain what the heck a “suspended app” is or means? Thank you. Well just peeked again and today it’s at 29.88. Bad news. This lowered my system storage from 10GB to 7GB but the total storage used remained exactly unchanged. Seems to have shifted cached data from system to the storage devoted to the apps themselves. Here my iPhone 7plus going mad with the system storage taking 64 giga and growing. Every time I try to open more space deleting a video or an app the storage system grows… the trick suggested didn’t work. I had the same problem with my 6s. The Other storage is actually data that is already deleted and waiting to be re-written again. That is why every time you delete an app, the app storage become smaller and other storage increase. I backed up, factory reset and restored from the backup. and Other storage was 0 again. I have a 32gb iPhone 6s and my system storage is 27.6gb – haven’t tried the iTunes trick but neither will I considering responses from above. Took it to store many months ago and the apple ‘genius’ was literally open mouthed! Without booking back an appointment that I cannot make due to work in a weeks time and going without a phone while they do checks it seems I have no option but to now look elsewhere for a phone! That being said the last 3 iPhones I’ve had have all mysteriously started going wrong when an upgrade is on the horizon! This is ridiculous! 28.84 GB used by system if my 32 GB available!! I just tried this and my system storage *increased* from 20-35!?!? If System is that big it is probably an error. I would restore and reinstall. I notice any time I delete files from my phone, the System storage increases to close the gap, until nearly all the space is used up again. It’s probably filling our Systems with junk files in order to encourage people to purchase more memory and more expensive devices. Capitalism, gotta love it. . .
My iPhone 6+ has 64gb storage and guess what, the system storage takes up MORE than 45gb! This stresses me out so much and I don’t know what to do abt it! Tried that method of plugging in to the laptop with itunes on but it didn’t work. I’m up to the point of giving up iPhones now. If anyone has a better solution please let me know. Thanks! It worked for my iPhone 6 with iOS 12! 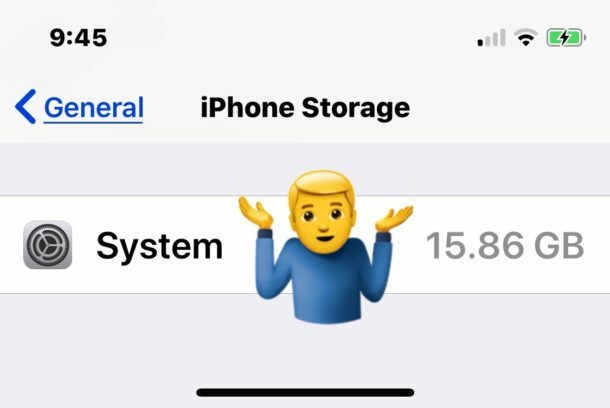 Glad to hear it worked for you to reduce System storage in iOS! It works pretty consistently with my iPhone and iPad too, but I don’t quite understand why. My hunch is that when you connect an iPhone / iPad to a computer with iTunes, the device starts preparing itself for syncing and may dump some internal caches, maybe virtual memory, and other temp files, and it clears those out thereby freeing up space. It’s just a hunch, but I think it makes logical sense since that would not want to be backed up to iTunes. Just a guess, could be other reasons. This clears the cache and may need to be done a few times to see a noticeable difference. Worked! 32 -> 15. Great! After all the resets and clear caches finally, I figured out what the issue on my phone was. The “other” was using 24GB out of 32 GB phone. Go to WhatsApp -> settings -> Data & Storage usage -> Storage Usage. Here groups/chats would be listed with the amount of memory usage. Clear those and see the magic. Ooops finally I have my phone back to working state. Bang on! WhatsApp has found a bug in iOS!!! It appears iOS seems to classify most of the WhatsApp chat media as system storage or other. Just prune your WhatsApp chat Media (videos, photos etc) to see your system storage reach to actual levels. This works. I had systems size at 18 GB…cleared some whatsapp groups storage..and now its dropped to less than 10.
iOS does not recognize and calculate whatsapp data (was showing 99MB as an app in manage storage.. instead, probably a bug…all storage goes under systems.. Would suggest clearing up your whatsapp storage to see if it does make a change for you. Wow! I literally had 2gb of storage left on my 6s (64gb). I didn’t have enough space to update to iOS 12.0.1 so I decided to plug it In laptop and update via iTunes. It took foreverrrr to update and backup. After updating, my storage went up to 5gb. I just checked now (2 days later) & my storage is 45gb out of 64gb! How?! I had to recheck my photos and videos and all were still there…I have no idea how this happened. The update took about 3gb. Did my picture/video file size or quality shrink? I’m still in disbelief how my storage increased drastically! It’s like I have a brand new phone! The system storage section of the iPhone storage covered everything that doesn’t fit in the other categories. When you visit that section it calculates the sizes of app, photos, etc. on the phone. Any volume it has not finished counting gets lumped into the system storage, which makes it appear bloated. Leave it a few minutes and look again your system storage will have shrunk right down. Nothing to do with plugging it into itune, it is the waiting for a few minutes that is the key. Actually, my bad… when I disconnected it, it went down below 7 gigs… thanks for the tip!! The itunes thing totally worked! Mine went from 12gb to 7gb in about 5minutes :) Thanks! WOW! I went from 20GB to 6.72GB!! Thanks! Definitely give this a try if yours is absolutely massive, as proven I have shaved 14GB off of mine! No need to erase all contents……..
For those with 20 GB of system storage, it’s likely a 3PTY app with messaging capability, like WeChat, WhatsApp, GroupMe, Facebook, etc that’s causing the errant number. Unlike iMessage that will auto-delete messages, these apps store their data within the phone’s cache and system data. No need to backup or restore anything ! I just spent some time with a good Apple Care advisors : this problem is caused by iCloud Drive. If you deactivate it, no more problem. It worked for me. Guys I removed Hotstar and it cleared 30 gb. It was storing even my deleted videos as system files. Basically remove 3rd party video streaming apps like Netflix hotstar prime video. It will free up space. this itunes hack does not work at all. you must delete your iphone and restore it again using your icloud. from 13 GB of system im now at 5GB! I dug into this and found the culprit: iOS app cache sizes. When you open up your storage it puts all of the data for each app into the ”System” allocation for size (my apps took up 100mb, and system took up 46GB), but after letting the phone sit for around 3-4 minutes iOS sorted all that data and accurately assigned each app their respective data usages, which brought my total System usage to 8.39GB. It appears that this ”trick” really isn’t freeing up any space, it’s just assigning each app their own respective cache usage, then recalculating storage space. TLDR: “System” actually includes iOS System Data AND App Cache data, which is then sorted into each individual app, but it takes a few minutes to complete, which most of us jump out of the screen before this happens. It seems to automatically happen when connected to iTunes, hence the ”trick” working for some. 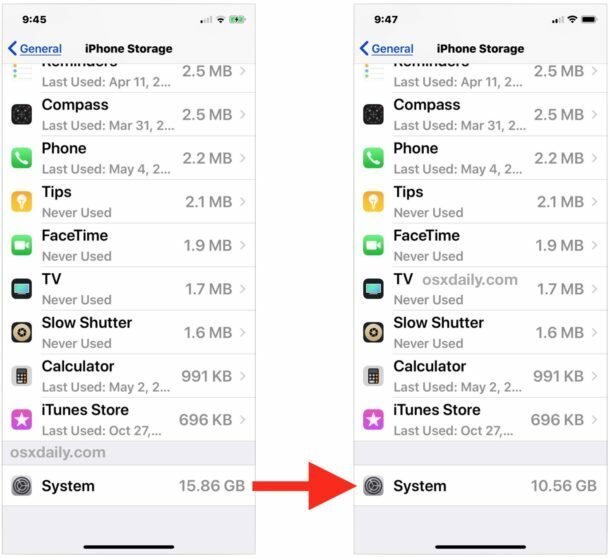 Fix: Apple should put all cache data into an ”other” or ”app data” tab on storage while it is being sorted, this would prevent it from bloating the ”System” tab until the phone calculates the correct per-app storage usage. I have a 128GB iPhone 7 and 42 GB are taken up by “system” and I’ve found that deleting pictures helps it go down. I have 60GB of pictures it says but when I delete photos both the picture category and the system category go down. Like most comment-ers here, I’ve been an apple user for probably at least a decade or more. When Jobs ran the company it was ‘flawless’, it’s part of what made Apple in a league of it’s own. Times have changed though, today the issues of a bloated ‘systems’ file, ios releases that cause more harm than good, and the unwillingness of apple to give users more control over their devices, has me for the first time, seriously considering making a wholesale device switch to something else. I already have an aging ipad that I’ve decided not to replace. My 8 year old mac desktop could use replacing, but I’m too sour on apple right now. For now, the iphone8 remains, but in a couple years…unless Apple starts getting their act together, I may be searching elsewhere. Just tried doing it, didn’t work so well (no internet connection) but it seems it was all downloaded Netflix movies that had expired. The iPad didn’t auto delete them when expired or logged in. Had to go through and manually delete. “System” went from 31gb used to 6.5gb used. Guys your comments made me think the worst. What if . . . Apple does taking pictures secretly as well as screen capturing, and pile the result in the “System” storage category until it has a way to transfer those into iTunes or other Apple Servers. Scary Thoughts . . . I have 53.4 gb on my system does anyone know how to clear it? Like many have said, I’ve been seeing my System Storage grow and plugging my phone into iTunes didn’t work, so I did some trial and error tonight when I couldn’t sleep. I went into Settings>General>iPhone Storage and scrolled down to the bottom. Earlier tonight I had 37GB of system storage, which has been driving me nuts. I think a few people have mentioned that the system storage number at the bottom is misleading. It’s including the size of the app and the docs associated with that app as well. I started selecting each app to see how large the docs and data were, and I started offloading some of the apps to see what would happen. Within a minute of offloading Apple Store, the system storage dropped by 10GB. I also did this with Weather Channel, Walmart, Hilton Honors. I also deleted some apps completely bc the data was huge and I stopped using the app anyway. Offloading won’t hurt anything and you can easily reinstall the apps. I reinstalled TWC and Apple Store and the file is still half of what it was (even though the number at the top didn’t really change; the system storage size changed at the bottom but the total iPhone storage didn’t really, which supports the assertion that the system storage size at the bottom is misleading). I guess no need to freak out when you see that number at the bottom, and if you don’t want to do a factory reset and restore, try offloading some of your apps to see if that helps. Hope this helps some of y’all. The system storage on my 64 GB iPhone 6S is 42.39 GB! And now i keep receiving a message that my storage is full! I already tried this trick but nothing happen. Please help me! My 7+ system storage has just dropped from 35GB to 12GB just by connecting to iTunes. Thanks for the tip! Glad it worked for reducing your iPhone System storage Gareth, thanks for the feedback! I could not load a recent iOS upgrade on my iPad because of not enough storage available. My iPad is a 16 gb machine. Unlike some of the other comments my problem was identified in going through and looking at each app in terms of documents and data I found two apps which were storm radar and RBDigital that showed an unrecognizable number like 136434654 that had no MB designation after the number. This was a red flag for me. I deleted both of these apps and after doing so my “other” storage went from 12 gb down to 9gb and system storage gradually counted down over a 5minute period from 12gb down to 8gb. Obviously, both of these apps were somehow corrupted and causing a problem for IOS. I could now upgrade my iOS to the latest software. I then reloaded both apps that I had deleted which now ran fine and did not affect the storage capability of my machine. I have since looked at the storage utilization of those two applications and they seem to be working fine. My total storage used is 11.6gb of 16gb available. So I have almost 4.6gb free! My iPhone X had it’s system reduced from 23.4Gb to 12.5Gb. 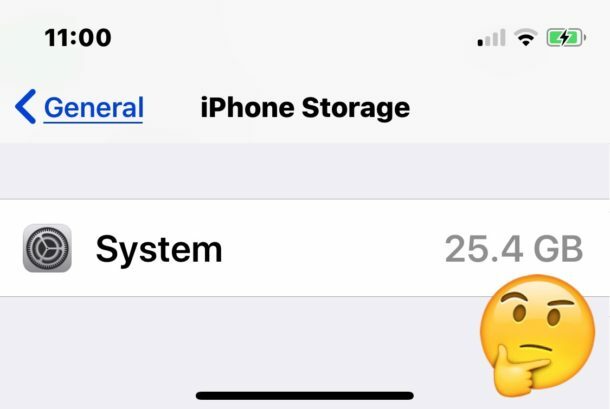 I’ve 256 GB IPHONE MAX and currently the system is taking 240GB ! I don’t know what to do ! Im so sad to see apple like this. It’s like apple dont get enough money out of my pocket. Dont worry apple. I support u. I will buy newest iphone with biggest storage and subscribe to icloud for 100tb. hope it will satisfy u.
Didn’t work for me. System storage is now at 90 of my 128. As I free up other memory, the system storage just grows. I ran out of total memory and freed up about 5 gig. Within a day or 2 the system storage grew by 5 and I’m just about out again. Connecting to a computer with iTunes shrunk my System size in half. Why would it do that, maybe it dumps a cache, maybe it recalculates something, who knows. This is such a silly issue. Mark, I think you need to try the next and most annoying option then: Backup, restore. As the article suggests, your next option is to backup the iPhone, then restore it from the backup. For a large iPhone like 128gb size it can take many many hours, even with iTunes it’s like a day-long experience to backup and restore a phone that size. With iCloud and a large phone it can take an extraordinarily long amount of time if you have slow internet, for me with a 10mbps connection it will take days to restore iCloud. Apple needs to fix the whole backup/restore experience, it was seemingly designed by/for people who live on fiber 1000mbps connections in the Bay Area. The bloated ‘System’ and “Other” size on iPhone and iPad is such an old problem that it makes you wonder why nothing has ever been done about it, whether it is a bug or what who knows, but it has existed since basically the beginning of the iOS experience. Some apps like WhatsApp uses System Storage for some reason. For apps that don’t utilize iPhone’s proper storage etiquette, I recommend ditching. But if you must have WhatsApp, in WhatsApp Settings go to Manage Storage and you can start clearing groups/contacts that is stacking up in storage. On my friend’s phone, she had 12 GBs in videos in a group. If you have WhatsApp, look here first. This is a great point and the same idea of large storage usage applies to Instagram cache and other similar apps too. I have seen Instagram and Facebook take up several GB each, they will keep storing data repeatedly. Because iOS does not have an ’empty cache’ function you basically have to delete the app and reinstall it to clear that app cache.